While at Walt Disney World, you can embark on a fun log flume ride featuring characters and songs from a classic film featuring Brer Rabbit, Brer, Bear, Brer Fox, and all of their friends! The sensational ride features a cast of over 100 choreographed Audio-Animatronics including frogs, turtles, birds, and other happy singing animals. 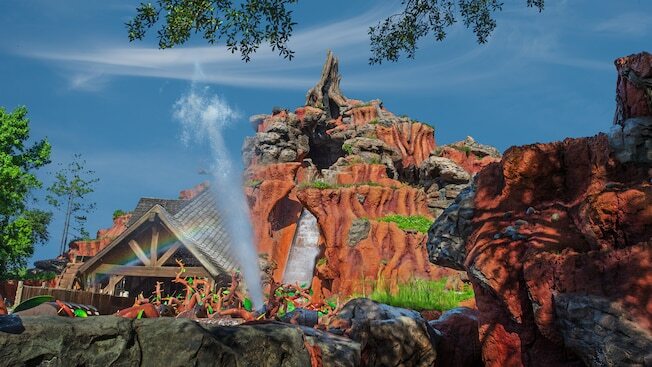 Take this fun quiz to test your knowledge of Walt Disney World’s Splash Mountain. What land is Walt Disney World’s Splash Mountain located in? How many riders can sit in each log of the Walt Disney World’s Splash Mountain ride at one time? Splash Mountain was themed after which Classic Walt Disney film? How tall is the final drop on Splash Mountain? What name was Splash Mountain originally going to be named? How many gallons of water are flowing through the WDW Splash Mountain ride? “Hee, hee, hee, hee, ha, ha, ha! Boy am I in luck! Yuk, yuk, yuk, yuk, yuk! Ha-yuk, yuk! A laughin’ place, to go ho-ho! On Splash Mountain, how fast does the log travel down the final big drop? After this extinct attraction closed, a number of audio animatronics were re-purposed into fun figures in Splash Mountain. Ouch! Guess I need to pay more attention to this ride! Pretty sure you won’t be catching me on Jeopardy any time soon! I put Song in the South instead of Song of the South. These quizzes can be pride-busters sometimes! I thought for sure I was going to get 100% here! Woohoooo!! So glad you like it… and you did amazingly!! Not one of my favorite rides, so I didn’t do so well…. Awesome! Glad you liked this one!!!!! Always the numbers that get me!